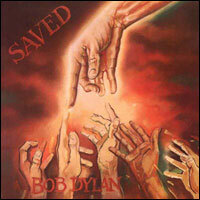 1980 saw the release of Saved, the born-again-iest of Dylan’s born-again Christian albums. Full disclosure here: my prejudice against both gospel music and organized religion makes me distrust and even dislike albums like this without even hearing a bar. The very thought of it creeps me out. But I have a greater calling here, one that has me exploring all of the Dylan albums I’ve avoided through the years, and I have to admit this is one of the more interesting detours.